Cephalopod experts at UC Berkeley have discovered that the larger Pacific striped octopus—seen here outstretched—employs a rare hunting strategy. 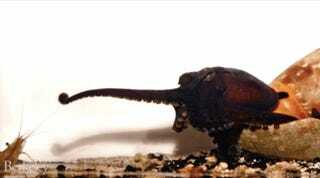 Instead of pouncing on its prey with all eight arms (a common technique among octopuses), it extends a single limb, like a grabby toddler, and startles its prey into clutches. That’s not the only thing unusual about the larger Pacific striped octopus: its mating habits are also, reportedly, mind-blowing.